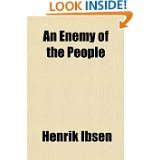 This is a study guide for the book An Enemy of the People written by Henrik Ibsen. An Enemy of the People (original Norwegian title: En folkefiende) is an 1882 play by Norwegian playwright Henrik Ibsen. Ibsen wrote it in response to the public outcry against his play Ghosts, which at that time was considered scandalous. Please click on the literary analysis category you wish to be displayed.